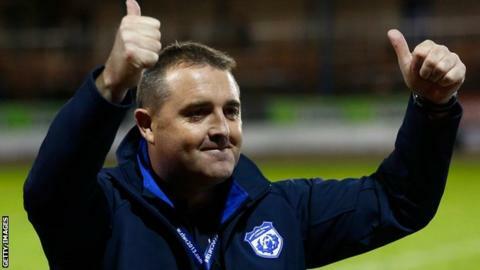 Steve McCormack insists Scotland "have a lot of improving to do" despite the 42-18 win over Wales in their Rugby League European Championship opener. The Scots ran in eight tries in Workington and take on Ireland next, with that match taking place in Dublin on Saturday 25 October. "We blew the cobwebs off in the first half," said head coach McCormack. "We felt, if we could just bide our time and be nice and patient, we would get some points and that was the case." "A lot will be made about Danny Brough but Louis Senter is the only player to represent Scotland at every single age group so it's a fantastic moment for him too"
Tries by Danny Brough, Corbay Kilday, Oscar Thomas and Jonny Walker, two from David Scott and one each from brothers Brett and Callum Phillips gave Scotland their 24-point win. "Callum was very unfortunate last year not to play in the World Cup so he's been waiting for this opportunity and he took it with both hands," added McCormack. "He was brilliant when he came on. For both he and his brother to score in front of their home crowd makes it extra special. "Broughy was first class again but there is no difference between Callum and Danny in our squad. "They've all got the same values and nobody is treated any differently. "A lot will be made about Danny Brough but Louis Senter is the only player to represent Scotland at every single age group so it's a fantastic moment for him too." Scotland's final match will be against France in Galashiels on 31 October, with the winner of the tournament qualifying for the 2016 Four Nations to face matches against Australia, England and New Zealand.